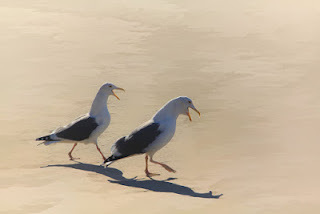 Bob Seagull: I really hate off-season, the beach is so quiet with no families around. Nancy Seagull: not a chip to be seen for miles. We're going to have to forage in the waves again. Bob Seagull: should we wait for the others? Nancy Seagull: probably, but I'm getting a bit hungry. Where are they all anyway? Bob Seagull: They're in that disused Railway Tunnel over by the breakwater. Felicity Tern's eggs are beginning to hatch and Kevin Tern hasn't yet returned from scoping out that new fishing ground, so she's a bit stressed, Angie and Janet are keeping her company, while Felix and Bobo are out looking for Kevin. Nancy Seagull: Felicity's eggs are hatching? Why didn't you tell me?? I should be there! Why didn't you say something? does she not want me there? why doesn't she like me? Bob Seagull: don't carry on like that. You remember she built the nest way back in the shadows and you don't like the dark so much. Nancy Seagull: oh that's right. Well, I hope the hatching goes well. Let's not wait for them, I'm really hungry now, how about we fly over by the old jetty and see what's washed up? Ew...see what's washed up indeed. You did a great job with this. only slightly confused; thank you. The 'washed up' came from a memory of two seagulls fighting over a dead fish on a beach a couple of king tides ago. Husband and wife are always looking for a good place to eat. Susan Kane; there's not many good eating places when there aren't any picnic on the beach. Nancy was the last to know about the hatching. I guess a little bird didn't tell her. Nobody sang like a canary. No stool pigeons there! Val; they all knew Nancy is afraid of the dark and also how she tends to stage-manage anything going on and they wanted a peaceful hatching. Margaret-whiteangel; thank you, I'm glad you liked it. You had entirely too much fun with this, didn't ya? It shows. Nice job. I love that pic of the seagulls. It really does look like they're carrying on a conversation, doesn't it? A great way to connect two completely different photos. Well done. Arkansas Patti; that was a bit difficult, the photos are so different. Heeheehee! An excellent bird conversation. messymimi; I often wonder what they birds are saying to each other.